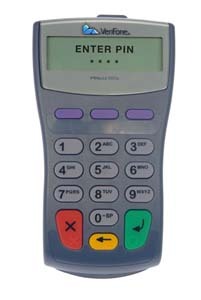 Fully compatiable with all Verifone terminals and many other terminals. The Verifone 1000SE is the PCI approved hand-held pin pad device. Its a rugged and one of the most popular and most common pin pad devices out there. The pin pad allows your merchants to enter their pin debit numbers so you can accept pin debit cards for credit card terminals that don't have a built-in pin pad device. Debit cards have lower transaction rates which can mean savings for you.